Lovely to see our Print Council of Australia 2004 commission, A lament to the sleeping kingfisher, on display as part of Imprint: A Survey of the Print Council of Australia at Parliament House, Canberra, until the 12th of May, 2019. This special exhibition featuring prints from the Print Council of Australia’s archival collection includes some of the first prints created by significant Australian artists, including the first Print Commissions, John Brack’s Untitled (Skaters), 1967, and Fred Williams’ Lysterfield, 1968, and the first Indigenous Australian Print Commission, Bush Figures by Ku Ku Imidji man Arone Raymond Meeks, along with works produced by PCA founders Grahame King and Udo Sellbach. The Commission, which began in 1967, invites artists to submit a limited-edition print for consideration by the PCA and its members. This has resulted in an archive of more than 600 prints, illustrating the rich history of contemporary Australian printmaking. Works of master printers and innovators including Noel Counihan, Barbara Hanrahan, David Rose, Ray Beattie, Bea Maddock, Earle Backen, Ruth Faerber, Hertha Kluge-Pott, Olga Sankey, Judy Watson, Janet Dawson, Mary MacQueen, Raymond Arnold, G.W. Bot, Yvonne Boag, James Taylor, John Coburn, Jenuarrie Warrie, Maria Kozic, Wilma Tabacco, Rick Amor, Treahna Hamm, Robert Jacks, Bruno Leti, John Olsen, Michael Kempson, Susan Pickering, Andrew Ngungarrayi Martin, Belinda Fox, Georgia Thorpe, Gracia Haby & Louise Jennison, Gosia Wlodarczak, Rebecca Mayo, Janet Parker-Smith, Rona Green, Sophia Szilagyi, Glen Mackie, Tama Favell, Elizabeth Banfield, David Fairbairn, Graeme Drendel, Deanna Hitti, Sue Poggioli, Maria Orsto, Samuel Tupou, Pia Larsen, Deborah Klein, Cat Poliski, Heather Koowootha and Glenda Orr will also be on show, as will a diverse range of printing techniques representing styles from the late 1960s: from relief printing (carving into lino or wood where recessed areas don’t hold ink and transfer to paper ink-free) to intaglio (etching, engraving, aquatint, drypoint, mezzotint) and planographic (lithography and screen-printing) as well as digital printing. 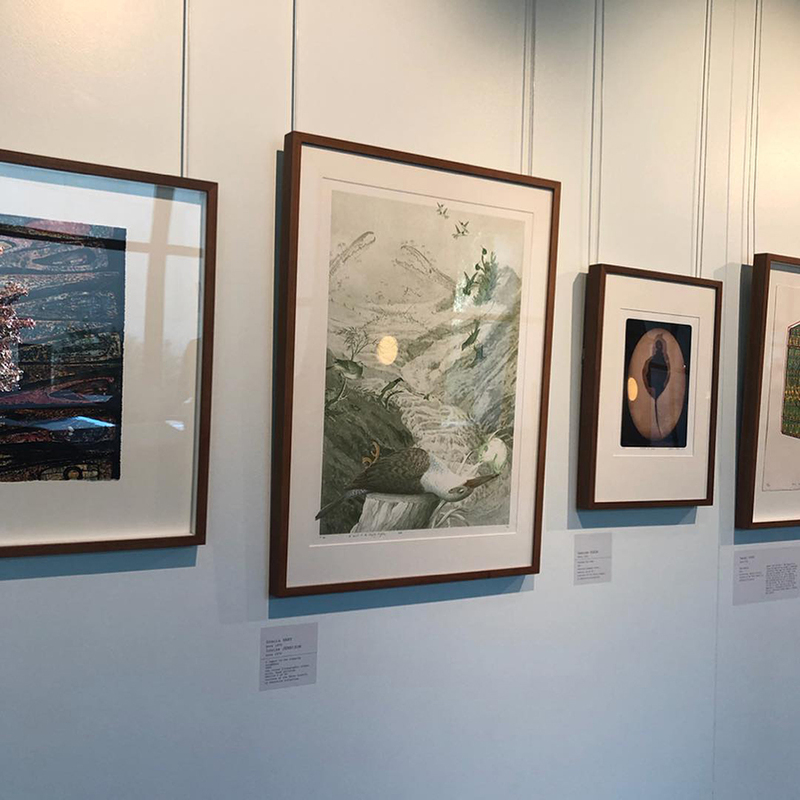 While the exhibition is mostly Print Council of Australia works – fifty-eight works – the remainder are from the Australian Parliament House Art Collection, including two new acquisitions, linocuts by artist Jenny Kitchener, recipient of the 2017 Print Council Commission. The Print Council of Australia was established in Melbourne in 1966 by printmakers Udo Sellbach, Grahame King and curator Dr Ursula Hoff to promote the artform of printmaking. The 1940s-60s had seen the return to Australia of European-trained artists, sparking a resurgence in the importance of printmaking and its commercial viability. Open until the 28th of January! Hoot! Hoot! Our exhibition, Ripples in the Open, was meant to close today at 5pm, however we are delighted to announce that it will be open for tomorrow’s public holiday, Monday the 28th of January, from 9am to 5pm. We've created a print of barnacles and a Black swan for the Australian Print Workshop's 2018 fundraising exhibition. The exhibition runs until Saturday the 16th of February, 2019. 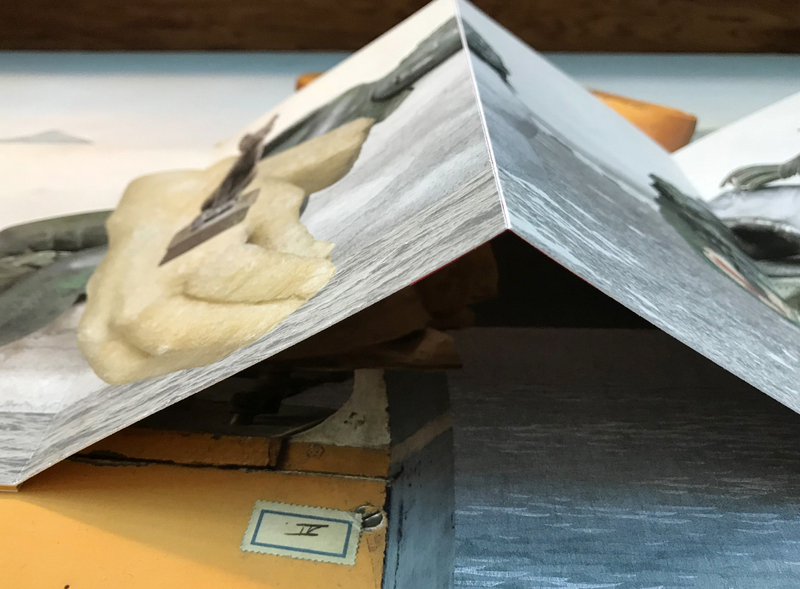 You're invited to explore a collaged landscape comprised entirely from images scanned from borrowed library books, and studded with lenticular prints. Ripples in the Open is a collage, 15 metres in length, commissioned for ArtSpace at Realm. Officially opening this Thursday the 15th of November, 6–8pm (including a talk, by us, somewhere in the wilderness). You’re invited to our exhibition, Ripples in the Open, and we’d love to see you there. Join us for the exciting exhibition opening of Ripples in the Open by Melbourne based artists Gracia Haby and Louise Jennison. 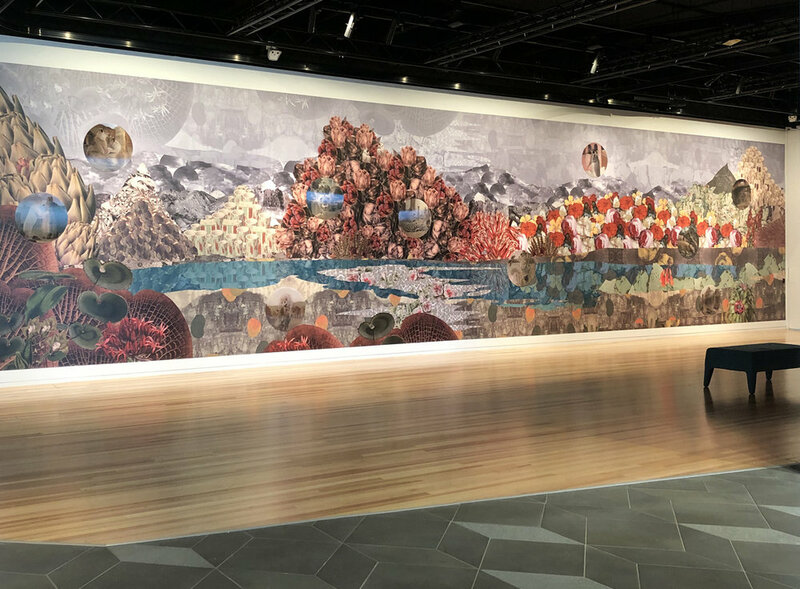 To be opened by the Mayor of Maroondah City Council on Thursday 15 November at 6pm, to be followed with a talk by the artists about the process of imagining and creating their captivating works — from the intimate to the monumental. 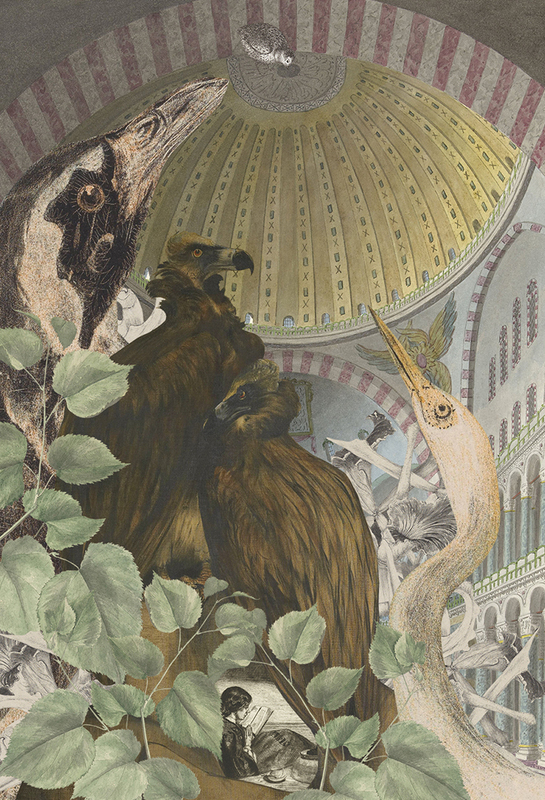 Gracia Haby and Louise Jennison have been commissioned to create a huge collage for ArtSpace at Realm, presented as a floor-to-ceiling printed landscape featuring portholes of moving collage comprised of stunning lenticular prints of animals. This exhibition invites you to join the artists in an exploration of things hidden in plain sight and to be immersed in an imaginary and not-so imaginary world. Happy to chance across three of our zines from 2010, A folded drawing of a Sulphur-crested cockatoo, Views in my pocket, and We are dreaming of the sea, on display at State Library Victoria as part of their permanent exhibition, World of the book. To define a zine is to delve into the do-it-yourself culture of self-publishing and self-expression. The term ‘zine’ originated in the science-fiction ‘fanzines’ of the 1930s, and now encompasses any non-commercial, non-professional, short-run publication that seeks to be defined as a zine. They can be traded, sold, gifted or collected, while remaining ephemeral at the same time. 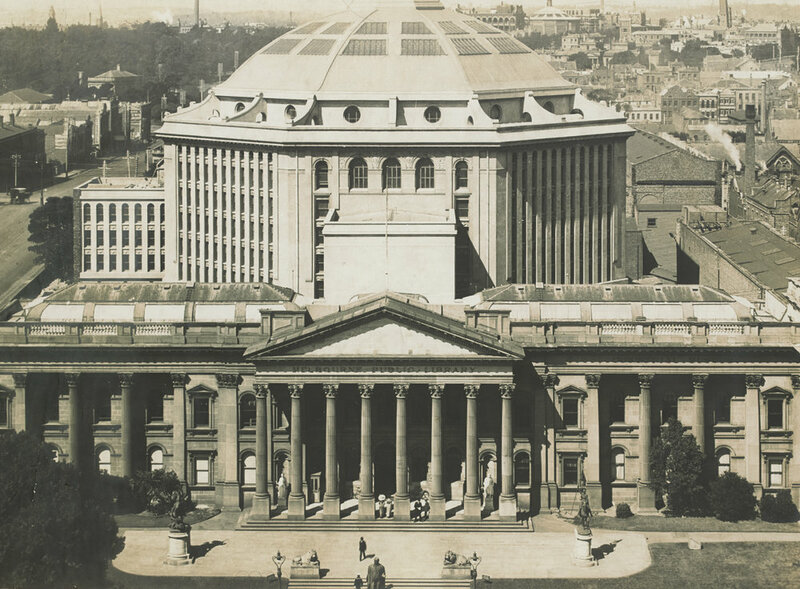 The Library has over 15,000 zines, making it the largest public collection in Australia. We have created Not my sky (exhibit A), 2017, especially for Rona Green's print exchange and exhibition, Imaginings. Launching this Saturday 2nd December from 2pm. See you there. We are delighted that our exhibition, Looped, has been invited to stay on display in the library until August, 2018! Looped was initially set to fold away today, the 26th of November, 2017.